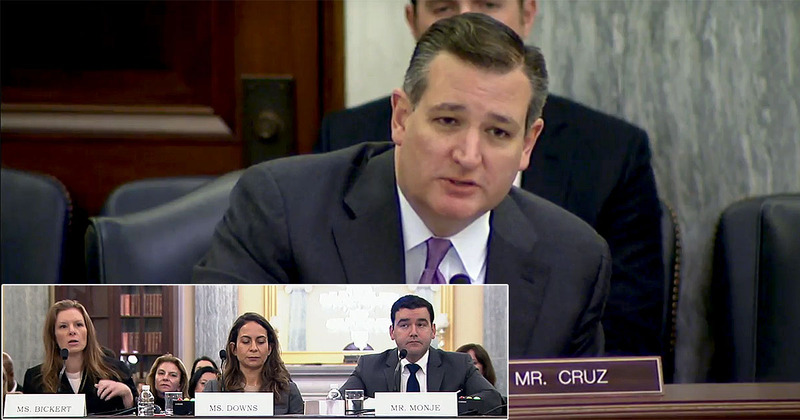 Senator Ted Cruz (R-TX) had the opportunity on Wednesday to question representatives of Facebook, YouTube and Twitter about their censorship of conservative content. If they have their way, you’ll never know about it. You won’t the video or read this article. The hearings came on the heels of an announcement of increased censorship by the fiendish Mark Zuckerberg, that Facebook will be making it much more difficult for those using that company to find content such as this video and article. Unfortunately Cruz didn’t have enough time to interview the wretched Facebook hag, a bug-eating man-hater from all appearances and most certainly a Democrat libtard, named Bickert. He spent most of his time going back and forth with the deceptive representative of Twitter. All three engage in censorship and demonetization of conservatives – none of them admitted to it despite being under oath. Cruz asked a simple question of all three, seeking a simple yes or no answer. He asked Bickert first, who apparently misunderstood the question and served up a regurgitation of their supposed mission statement. She said their objective is to connect people regardless of their ideology or politics, which is untrue. They remove conservatives from newsfeeds and their curators give preference to leftist content. Monje defends Twitter by stating that those who were caught on the hidden camera interviews were speaking on behalf of themselves, not officially for Twitter. Of course they were describing their personal experiences working at Twitter, but the fact that they weren’t “official spokespersons” apparently is enough to classify them as liars, according to Monje. He then attempts to lump all of those his company censors under a label of spammers using malicious automation. Spam is in the eye of the beholder and for these digital thugs, it’s synonymous with conservatives. Malicious is also a subjective term, which those in the video defined as being believers in God, Guns and America, rednecks, as they derisively put it. 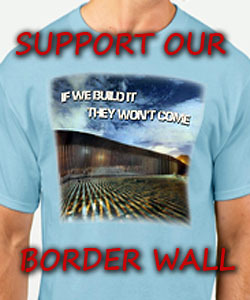 He admits that his company down-ranks a user for “engaging in targeted abuse against minorities,” which is interpreted as pointing out that the border is open, Islamists are being imported and that dangerous Muslims are entrenched within our government. Sounding alarms and anything else that works against the invasion and takeover of our nation can always be defined as targeting minorities. Targeting whites and patriots is perfectly acceptable, though. Cruz clarifies, “For some people who are posting you’ll restrict viewership only to those who are actively following them?” Cruz continues to construct the trap out of the Twitter twerp’s own words. The censorship is ongoing. There is no doubt about it among those of us in the alternative media, those of us who are left as our audiences are increasingly and maliciously reduced by these predator leftist companies. Hopefully Cruz and others will invite some of their conservative media victims in for a chat, with numbers and tales of their experiences. All of the leftist propagandists are lying and silencing conservative voices, in order to control the minds of Americans. They lured America in to make themselves a critical part of our communications infrastructure and are now excluding those they are politically opposed to in order to advance one side of the debate, the globalist, anti-American side. Sherman Act might bring them in line. They are not providing a proper service. So, why doesn’t everyone QUIT Facebook? I did .. long ago. They’re afraid of suffering Facebook withdrawal? Okay, then everyone should quit bitching about this conservative slap down; it’s no different from TSA haters, who refuse to quit flying even for a week. I’m doing what I can economically, my signature portion of every article recommends GAB only now and a direct subscription to my site. I don’t even ask people to like my page anymore because they’ve got me choked down so much I don’t want to draw anyone new to them. Unfortunately, and very unfortunately, they are the only game in town right now traffic-wise for web publishers. It would be great if Congress would break them up in an anti-trust action like they did with the Bell company back when I was much, much younger. like i said i am banned from facebook, and suspended from twitter. and i DON’T miss the SOB’S AT ALL. Unfortunately, IMO, that will be the end of it. Cruz is a great grand stander but, like Gowdy, nothing will happen. Gowdy at least puts’ on a show. I’ll gain some respect for him if these people are fined, prosecuted, or otherwise regulated. “Mr. or Ms. ____ this video, clearly, of you shooting a person, is that you”. “Thank you for that question and the ability to clear it up, I have never condoned that type of behavior”. “Thank you for being here and testifying today”. I would suggest sending Cruz data on these censorships, but, it would wind up in the circular file.